Published: March 25, 2013 at 12:12 p.m. 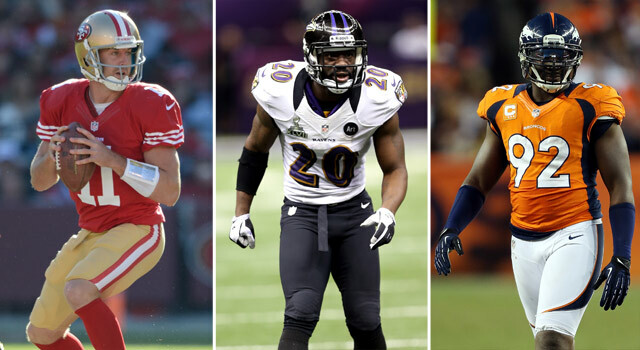 Updated: March 26, 2013 at 05:16 p.m.
Alex Smith, Ed Reed and Elvis Dumervil (from left to right) promise to make noise with their new teams in 2013. The key to building a consistent winner in the NFL is drafting and developing your own talent. While the top executives in the league adhere to that premise, they're also willing to look to free agency or the trade market to add a key player or fill a critical need. Such moves certainly come with risks. Trying to fit a player into a specific scheme with which he isn't yet familiar can be tricky, and landing a marquee name can cost a significant amount of money. But in the ultra-competitive NFL, organizations must occasionally gamble on the kinds of personnel moves that can make a good team great. Given a few weeks to thoroughly examine what has unfolded this offseason in the free agency and trade markets, I've put together a list of 10 players who can alter the NFL landscape with their new teams in 2013. It's uncommon for a quarterback with a record like Smith's (19-5-1 over the past two years) to change ZIP codes, but the emergence of Colin Kaepernick made the former No. 1 pick expendable to the San Francisco 49ers. Chiefs coach Andy Reid will reap the rewards of adding a winning signal-caller to a roster in Kansas City that now ranks among the most talented in the NFL. The noted quarterback guru gets an opportunity to accentuate Smith's strengths as an efficient playmaker by crafting clever game plans featuring the Chiefs' primary weapons (receiver Dwayne Bowe and running back Jamaal Charles). Reid has a reputation for developing winning football teams; Smith's arrival could turn the Chiefs into legitimate AFC contenders down the road. Seahawks coach Pete Carroll doesn't shy away from taking chances on talented playmakers with reported character flaws. He certainly pushed his chips to the middle of the table in acquiring the temperamental Harvin, who had worn out his welcome with the Minnesota Vikings. In doing so, Carroll gave the Seahawks a dynamic home-run threat -- someone who can do damage as a receiver, a runner or a returner. Not only does Harvin's explosiveness make the Seahawks downright scary to defend, but it also paves the way for a run at the NFC crown. Instant Debate: A shift in AFC power? Hall of Fame players are hard to find on the open market, but the Texans landed one of the most prolific ballhawks in NFL history in Reed. The 12th-year pro has 61 career interceptions; his knack for producing game-changing turnovers could take Houston's defense to another level. While there should be some concern about Reed's durability and tendency to gamble, the confidence, swagger and playmaking ability he brings to the Texans' secondary make the acquisition a worthwhile risk for a team in search of the missing piece. Running backs often seem to fall off of a cliff after they turn 30, but Jackson, who hits that mark in July, could defy the odds in Atlanta. The bruising runner gives the Falcons a physical presence on the ground, and he'll also be another weapon for quarterback Matt Ryan in the passing game. Jackson's combination of skills gives the Falcons' offense the versatility to handle any defensive tactic. This should pose a daunting challenge for defensive coordinators around the league. After serving a six-year stint as Tom Brady's security blanket with the New England Patriots, Welker took his talents to Denver to become Peyton Manning's top target between the hashes. Welker remains one of the top slot receivers in football, despite showing signs of decline. Where he once used to defeat defenders with exceptional quickness and burst, he now relies on savvy and guile to win over the middle. He's also a creative route runner who can torment opponents with his indefensible option routes. Given the versatile and dynamic receiving corps now at Manning's disposal, the Broncos' offense could be lethal in 2013. An infamous fax faux pas gave the Ravens a chance to add one of the most dangerous pass rushers in the NFL. Dumervil has tallied 63.5 sacks since entering the league in 2006, tied for seventh-most in the NFL during that span. Most importantly, he has forced 16 fumbles, emerging as a disruptive force off the edge. Dumervil will join Terrell Suggs to form one of the top pass-rushing combinations around, while giving the Ravens unprecedented flexibility when it comes to their pass-rush lineup. Although Dumervil's diminutive dimensions (he measures 5-foot-11 and weighs 260 pounds) make him a liability against the run, his ability to hunt the quarterback makes this a worthwhile gamble for Baltimore -- one that could catapult the Ravens back to the top of the AFC. A rangy athlete with superb instincts, awareness and anticipation, Goldson has been the best safety in football over the past two seasons. The punishing hitter has a knack for stopping runners in their tracks in the hole. Goldson and Mark Barron will form a dynamic duo for the Buccaneers in the back end. Able to affect both the run and the pass, the pair will provide an element of toughness and physicality that should set the tone for a dramatically improved defense. Rams coach Jeff Fisher has gone on record with his desire to surround quarterback Sam Bradford with better talent at key positions. Long, who has been one of the top left tackles in football despite battling an assortment of injuries throughout the years, is able to shut out elite rushers on the back side without assistance from tight ends or running backs. The Rams still don't have enough playmakers for Bradford to stand out as a franchise player, but the addition of a Pro Bowl-caliber pass protector will give the young signal-caller more time to operate in the pocket. As one of the most explosive playmakers in the game, Bush will add juice to a lineup that has been lacking it since Jahvid Best left the field for what was likely the last time. Bush's versatility as a runner and receiver will alleviate some of the pressure on quarterback Matthew Stafford and receiver Calvin Johnson to shoulder the offensive load. Bush was just 14 rushing yards short of notching his second straight 1,000-yard season with the Miami Dolphins, but his 372 career receptions are what truly strike fear in the hearts of defensive coordinators. Given that coach Jim Schwartz wants to utilize Bush like Sean Payton did with the New Orleans Saints, we can assume the Lions' offense will take on a different look in 2013. Adrian Peterson's miraculous season propelled Minnesota to the playoffs in 2012, but to become a legitimate contender in the NFC, the team needs a more balanced offensive attack. Jennings is a crafty No. 1 receiver with exceptional hands, ball skills and route-running ability. His presence on the perimeter will make quarterback Christian Ponder a better player while relieving Peterson of some of the pressure to carry the offense. Additionally, with his leadership skills and Super Bowl experience, Jennings can help the Vikings' young players understand what it takes to be a champion.